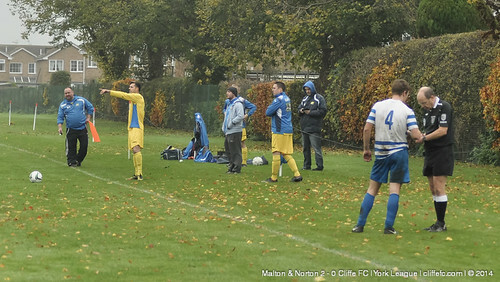 Cliffe FC lose 2-0 away to Malton & Norton in a fixture where the Oxen Lane club may feel they should have gotten more out of, the Malton side scoring a goal in each half. Cliffe FC first team came into this game on the back of two wins and for the first 20 minutes looked much the better side against the side currently sitting in the second spot in Division One, Chris Jackson coming close with a free-kick shortly after Tom Robinson had a point-blank range shot saved. Cliffe then got drawn into bickering with the referee’s decisions and their level of performance dropped and let the home-side back into the match. Jack Dinnewell had to leave the field due to injury and after being replaced by Andy Kirkham, Dinnewell kept on questioning the referee’s decisions leading up to the incident that saw him injured, so much so the referee showed Dinnewell a red card – Cliffe had already made the substitution so remained with 11-men on the pitch. Malton opened scoring right on half-time, a cross from the left wing eventually finished off at the back post, Malton’s celebrations a combination of jubilation and relief – 1-0 at the HT break. Cliffe needed to improve their discipline in the second-half, many players already being booked by the stringent referee. The away side started and looked the better side through-out the second-half and reduced Malton to a counter-attack with their long-balls nodded onto their quick strikers. 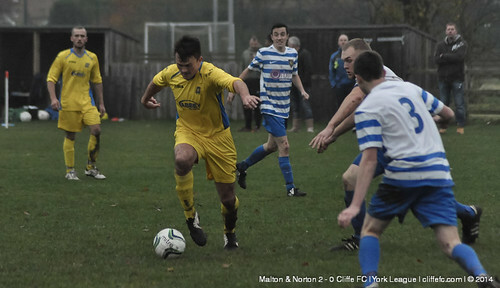 Kirkham and Andy Addison had the beating of Malton in the middle of the park, but couldn’t carve out any clear chances. Tom Hogg lobbed the ‘keeper for a simple tap in for Chris Jackson but was ruled offside and Chris had a couple of penalty shouts turned down – Chris’ twin Darren Jackson impressed once more at centre-back and earn himself man-of-the-match. Dave Laverack made some great saves at 1-0 and kept Cliffe’s hopes alive but it was a Malton counter that would any chance of Cliffe coming back into the match, the striker breaking the offside trap and squeezing the ball past the onrushing Laverack, 2-0. With an almost-unbelievable 10 minutes stoppage-time Cliffe couldn’t get a goal the match finished 2-0 FT.
Cliffe FC can take solace in the fact that in the last two weeks they have beaten the Division leaders in Cup competition and given the second-placed side a proper scare, so the points should follow in the coming weeks – however being drawn into ill-discipline will cause more problems for Cliffe’s ranks. Next week, Cliffe FC welcome the visit of Tockwith in Division One competition. Whilst hopefully the weather won’t claim the Reserves fixture like it did this past Saturday, Cliffe FC Reserves travel to Selby Olympia. The New Inn Cliffe FC MOTM: Darren Jackson. Laverack, Hallam (N Leach), Pearse (C), D Jackson, Parker, Dinnewell (Kirkham), Addison, Taylor, Robinson (Durham), C Jackson, Hogg.